The Shakespeare Timelines, in three parts, span the lives of two English monarchs Elizabeth I, 1533-1603, and James I, 1566-1625. Their lives encompassed the life of William Shakespeare, 1564-1616, and the publication of the First Folio, 1623. 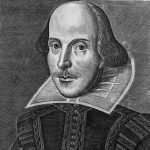 Shakespeare's writing career, from approximately 1590 to within a couple of years of his death in 1616, was divided between the two monarchs' reigns. These timelines place events in the context of political, cultural and scientific events that occurred just before, during and immediately after Shakespeare's life.